We’re back to the grind after an amazing ABC Conference last week in sunny West Palm Beach, FL! I’m revved to go & feeling so inspired! Anyway, I just love it when I get emails from people who want to write a Guest Blog Post for me! Takes the pressure off of me, gives a different perspective towards types of wedding ideas & it’s a great opportunity for all of us! A Win-Win situation in my book! Our latest Guest Blog Post is an Australian based Author, Raquel Merc. She is a writer and a homemaker. She’s recently contributed a variety of articles on home management and improvement. These include tips and ideas on practical matters like gardening, interior design, entertaining, and even kit homes. Check out what Raquel has for ideas for Bridal Showers at Home! If you’re throwing a bridal shower at home for a friend or relative, one of the most exciting things to do is thinking about the theme. But it’s also a crucial decision – it can make or break the event itself, especially since it’s a DIY. But don’t worry. 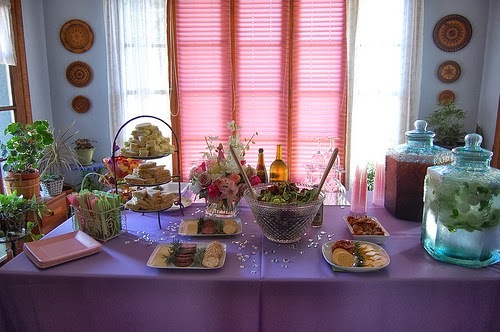 This article will take you through 3 great ideas for hosting a bridal shower at home that are so easy to pull off. Ready? Here we go. 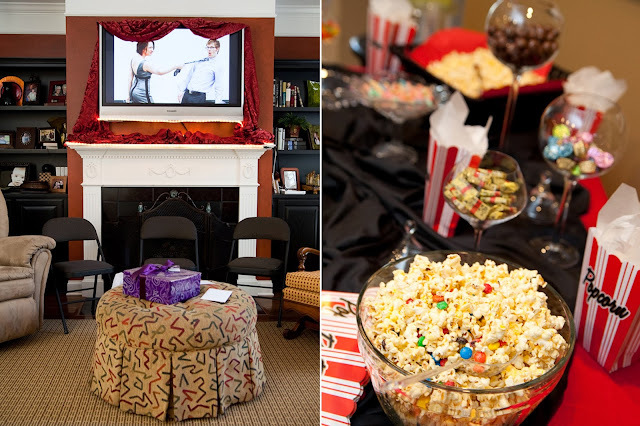 If the bride and her friends love movies and celebrities, this will definitely be so much fun. Make the VIP feel like a celebrity bride; let her really feel like the star of the night. In fact, everyone in the party should act like it’s one of those glittering nights in Hollywood. 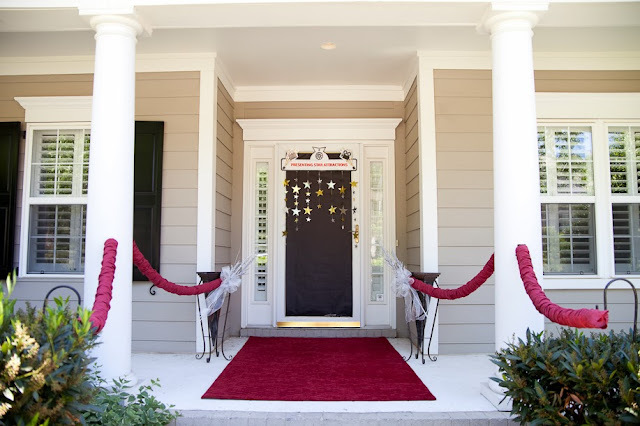 Roll out the red carpet. Or why not make it a pink one? Create a fun backdrop near the carpet where everyone can pose for pictures. Thanks to Evin Photography for the above stunning movie star themed pictures! Add shiny balloons and other glittering décor shaped like stars. Thanks to Minnesota Bride for the above image! You can just do charades and other such traditional shower games, but design it according to the theme. 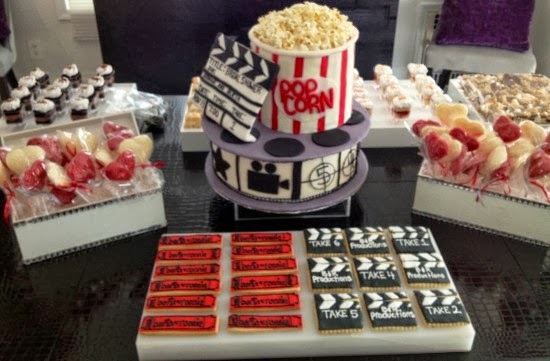 For instance, you can do charades with the bride’s favorite movies, TV shows, and celebrities as the items to be guessed. The food for the party doesn’t have to be fancy – popcorn in small paper buckets, drinks in cinema tumblers, and a cake with stars. Image provided by Project Wedding. Show a video of greetings towards the end of the program, just like when celebrities are given tributes. Gather video greetings from family and friends. You can just ask everyone to send in his or her video through e-mail. You may also include a surprise live Skype greeting with the mother of the bride or someone who can really make a heartfelt message for the guest of honor. Assign a team of guests for each room of the house – bedroom, kitchen, living room, bathroom, dining area, etc. And the party goes on focused on this setup. Each team will bring gifts for the bride according to their room assignment. 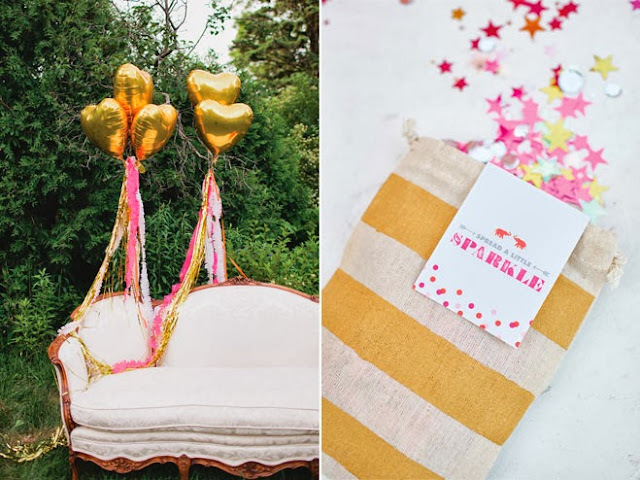 To differentiate the shower presents from the wedding ones, make each gift as personal as possible for the bride. For instance, give a personalized apron and oven mitt for the kitchen, lingerie for the bedroom, and so on. 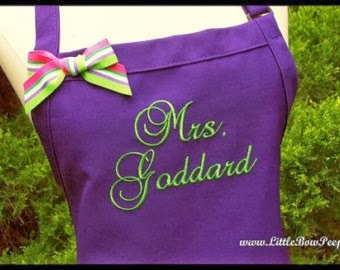 This apron can be found on Etsy by clicking here. Of course, Victoria Secrets never disappoints with the pretty lingerie. For the party décor, just make your place is as homey as possible. Add big cushions for some guests to sit on. Light candles with a subtle scent of apple cinnamon or coffee – something that says warm and comfy. Thanks to Heart of Light for the gorgeous image! And I just love the name of the company who provided the above image…. We are Not Martha! Serve more of the comfort food type than items from a traditional party menu. 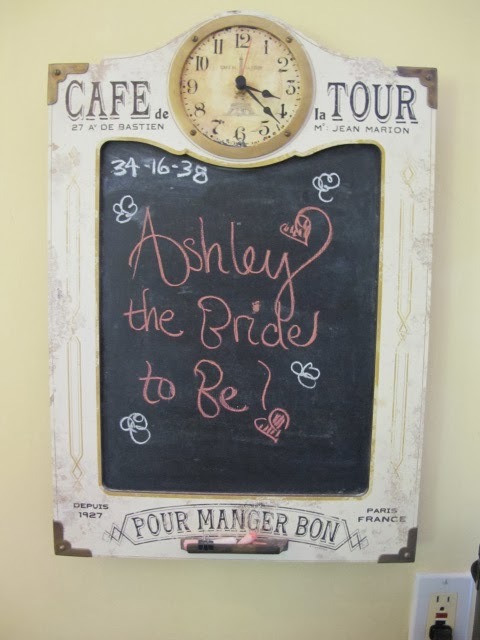 Maybe you’d want to ask the bride her favorite home-cooked meals. You can have everyone gather in the dining area for a family-style seating or near a fireplace, allowing guests to really feel at home. Assign a time of day to each guest and work the party around this arrangement. Gifts, food, and games will be according to the different times of the day. You can even incorporate the day-to-day habits of the bride here. Giving gifts will also be easier with this setup. A guest assigned to the 7 am slot can give a breakfast set. 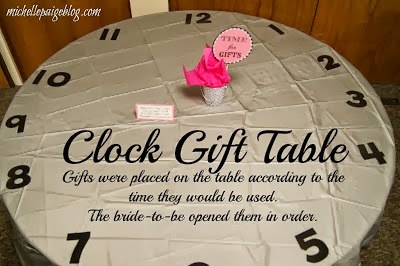 The more time slots are assigned, the wider the variety of gifts the bride will receive. A potluck arrangement will work well, too. Those in charge of the earlier hours of the day can bring breads, coffee, and tea. Guests assigned the midday slots may sponsor salads and sandwiches. And those representing the nighttime may bring cocktails and desserts. Decorate the designated party area in your house with different clock designs and numbers from 1 to 12. Use various fonts, materials, and sizes. How cute is this idea! 🙂 Thanks to Michelle Paige for the blog post! One fun activity you can do is a game where you need to matching game where you need to determine at what time each of the bride’s photos were taken. You can also have a guessing game about the important times in the soon-to-be-married couple’s relationship. Thanks to Michelle Paige for this picture too! 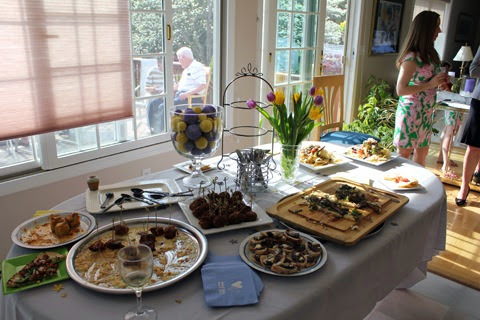 Remember that a bridal shower at home doesn’t have to mean boring and common. Think of themes that the guest of honor and the other attendees will be able to relate to. The ideas mentioned here can help you come up with your own kind of pre-wedding fun. What great ideas Raquel came up with! Thank you Raquel for reaching out and sharing your fabulous ideas! Looking for a unique shower idea, call or email me and we’ll have a brainstorm session to help you pick the right one!